4 Star Casting just announced an open casting call in Chitown for Spike Lee’s new Amazon Studios film, “Chiraq“. The project is looking to hire hundred of paid extras, featured extras and stand-ins. 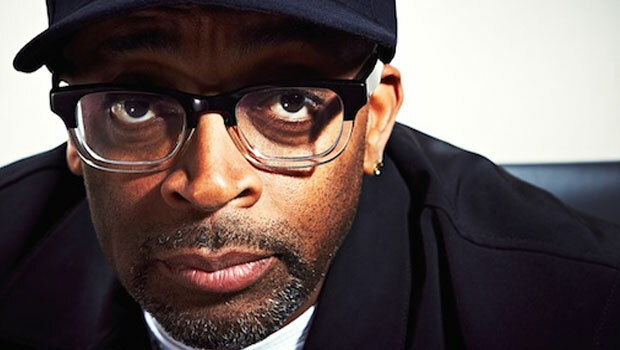 Oscar-nominated filmmaker Spike Lee will be filming his next movie in Chicago. The film is being made for Amazon Studios and will focus on the effects violence has on city neighborhoods. According to the Columbia Chronicle, the project will emphasize the subject of “black-on-black violence” and how it affects communities on the South Side. Not much is known about the plot but a recent Chicago Tribune report stated that Kanye West, Jeremy Piven, Samuel L. Jackson and hip-hop artist Common will all appear in the film. The Chicago Tribune article also pointed out that there has been some controversy over the film and the title “Chiraq“. The article states that Mayor Rahm Emanuel, members of the City Council and many city residents are opposed to the title and the image it may create of their city. The term “Chiraq” originated when Chicago’s homicide rates exceeded the number of American deaths during the Iraq War from 2003–2011, however many in the city find the term offensive. Last week, the Mayor met with Lee and asked him to reconsider using the word “Chiraq” as the title. Whatever the title may end up being… the film is beginning production in the Chicago area later this month and there is an open casting call scheduled. Chicago residents looking for a chance to be part of the Spike Lee film can come out to Sabina Academy next Saturday for a chance to be cast in the movie. Casting directors for the project are looking for Illinois based background talent to fill many small roles in the upcoming production. They are casting men and women of all ethnicities between the ages of 7 and 75. The movie is scheduled to begin filming this month and will be in production through July. The open casting call for “Chiraq” will be held next Saturday, the 9th in Chicago (see details below). Talent attending will not be allowed in without Illinois ID. 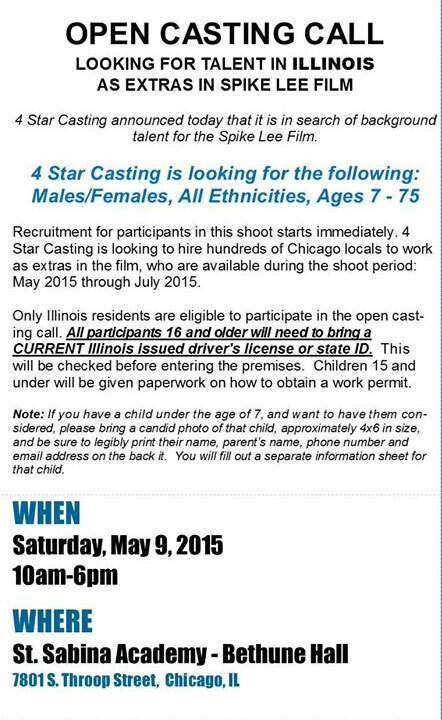 In order to be eligible to be cast in the film, you must be an Illinois State resident with current Illinois ID. All talent 16+ must have Sate issued ID and kids 15 and under will be required to get work permits if they get a role. All talent is asked to bring a 4 x 6 current snapshot of themselves with their name, phone # and email address written on the back. Please come ready to have you picture taken as casting directors will be on-site also taking photos of attending talent. The movie will be casting kids of all ages but only kids over 7 will be allowed to attend the open casting call. Parents of younger children may bring a photo of their child with them if they would like their younger children to be considered as well. Would like to be a Extra in the Spike Lee movie. The Crime in Chicago seems like we Live in a Third World Country. Chicago be Safe out There. Peace in the World is what is needed. As you can see, I have applied many times before for different acting parts with you. I am stlll very much interested. Please consider me. I am an experienced Costume Designer in the area…could I possibly attend the audition in that capacity? I would be very willing to volunteer my Costuming Services with your film project, if given the opportunity. Please let me know. Thank you kindly, in advance. The auditions are being hosted by the extras casting directors which are hired by the producers to only cast the listed roles. I doubt they are the right people to talk to about crew work, but maybe someone there knows who you should contact. I’m from Gary…5 minutes from Chicago. Does this exclude me? I am SAG, I starred in ORIGINAL GANGSTAS… I am also a published author. I want in! Spike Lee the best producer ever & I’m down for the cause. It would be an honor to be a part of this project. I’m from Chicago. I’m the man for the job. I wanted to know do I need to bring anything Saturday? I think they asked for a photo. Bringing 2 forms of ID is always a good idea also in case you need to fill out forms. I have great potential and well talented. I just need a opportunity to show what I got. I’m a artist that is well orientated with Chicago. I was born and raised, nobody no more about chiraq then me, plus I’m trying to advance my career and this looks like an opportunity. From Chicago and I’d love to star In Spike Lee’s new movie. I would love to audition please send me info to my email address, I live in chicago il. This is an open call, they are not taking email submissions. You must attend the event. I will love to get a casting call to show my talent.